We conducted AMT and MT surveys across the Hawaiʻi Island ‘Saddle’ region. Click on the map to enlarge. The Humuʻula Groundwater Research Project (HGRP) aimed to research the groundwater resources in the Hawaiʻi Island ‘Saddle’ region between Mauna Loa and Mauna Kea volcanoes by drilling two test holes on Army Garrison Hawaii land. Results include the discovery of: i) groundwater at a much shallower depth than expected, ii) a dike-impounded aquifer, and iii) a potential geothermal reservoir. By using the diamond wireline core drilling technology, we collected a continuous sequence of rock core. We documented our progress in a blog and made a complete stratigraphic record of the region. 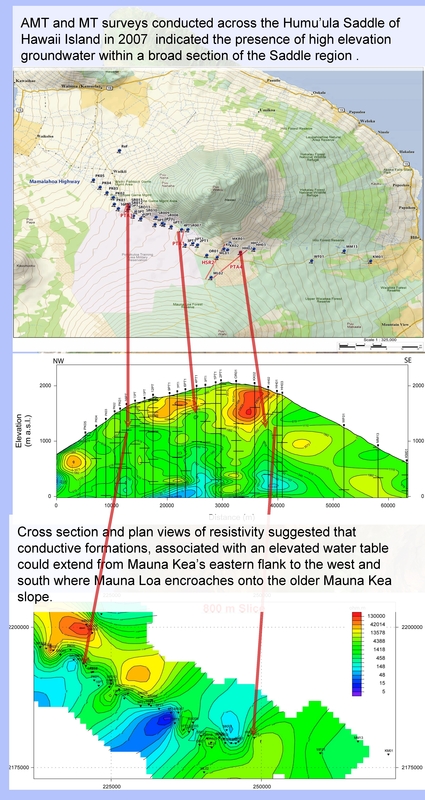 This continuous stratigraphic sequence contained subaerial shield-stage and post-shield-stage lava rock and ash samples from the Mauna Kea Volcano, documenting the area’s environmental, geologic, hydrologic, and thermal history. 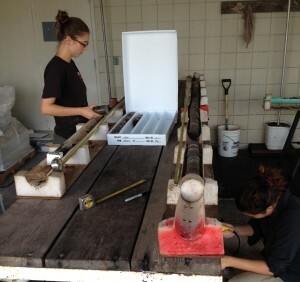 Team members Liliana and Lima box and dry the core runs. We processed, categorized, and logged the rock core, which will contribute to future scientific work. The Hawaiʻi Scientific Drilling Project (HSDP) will also examine the samples and use them for further research. During and after drilling operations, we monitored and analyzed the groundwater in the boreholes to determine whether long-term water wells can be built for PTA’s use. From the depth of 0’ (beginning of the hole) to 3,000′-3,500′ — drill with a PQ-sized bit (3.378” core diameter). From 3,000′-3,500′ to the bottom of the hole — drill with an HQ-sized bit (2.5” core diameter) and use the drill pipe as casing. Test core — click to enlarge. For the second hole, the exact PQ-to-HQ transition depended on the downhole rock stability. ~215 meters (700’) below the ground surface — The initial stable saturated zone. 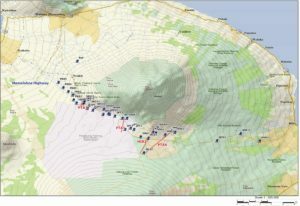 Resistivity across the ‘Saddle Region’ — click to enlarge. ~215 meters (700’) – 345 meters (830’) — A perching layer of clay-rich ash. Water levels began to drop. 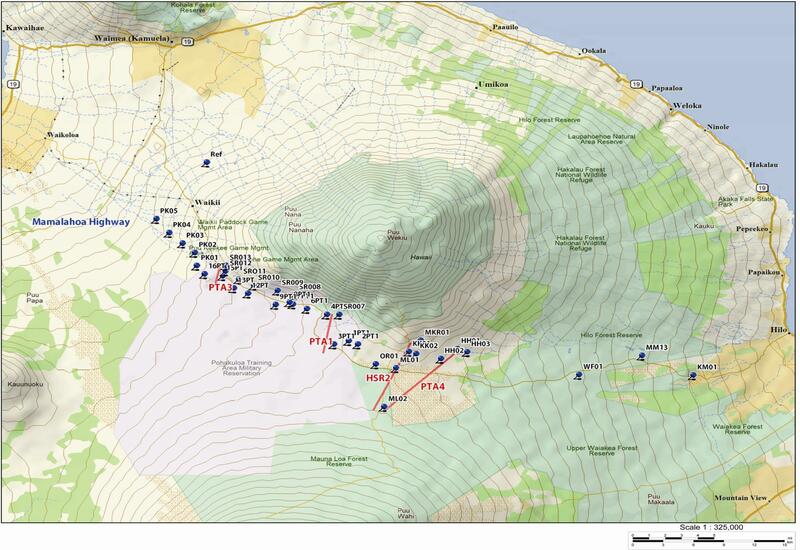 345 meters (830’) – ~550 meters (1,800’) — Dry rock. ~550 meters (1,800’) — A second saturated interval. ~550 meters (1,800’) – 1,763 meters (5,780’) — Water levels in the borehole remained stable. This deeper water is likely the regional water table for this area. ~1,000 m and beyond — The borehole temperatures showed significant increases. 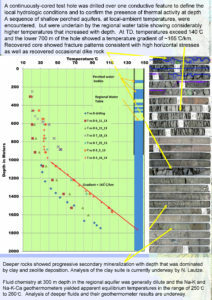 Intervals of intruded dike rocks indicate a dike-impounded aquifer. Along with the unexpected presence of high-elevation water, the borehole temperatures significantly increased below depths of ~1,000 m, suggestive of a previously unknown geothermal reservoir in the Saddle region. Evidence of dike complexes — click to enlarge. To measure the extent of the regional table found by the first hole, we drilled a second test hole approximately 10 kilometers west of the PTA-1 borehole. 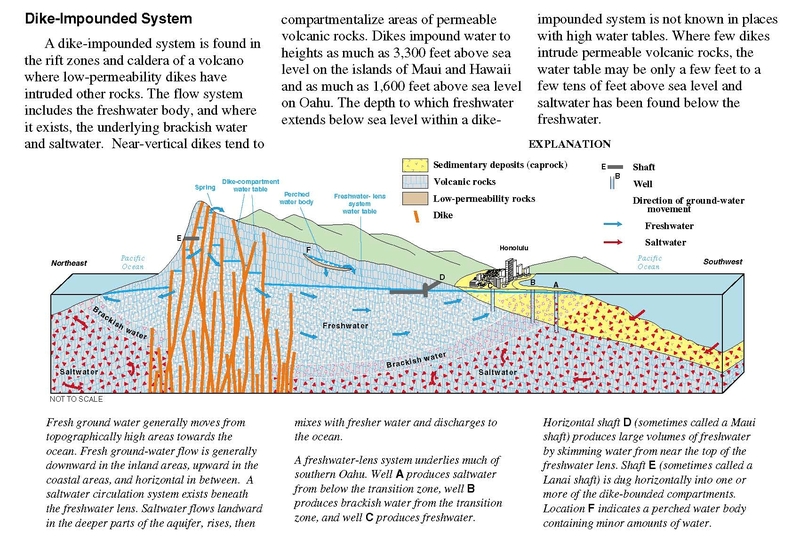 Within the top ~1,500 meters the hole did not encounter the regional aquifer, but found a sequence of confined, pressurized aquifers from ~300 meters below the ground surface. Layers of soil, ash, or explosive eruptive deposits confined these aquifers as highly pressurized water trapped between impermeable layers. Hence, as we drilled into the aquifers, water came spouting from the point of entry to up the drill string to several hundred to several thousand feet. As of this writing (March 2018), we continue to monitor this borehole and are testing for the water source and quality. 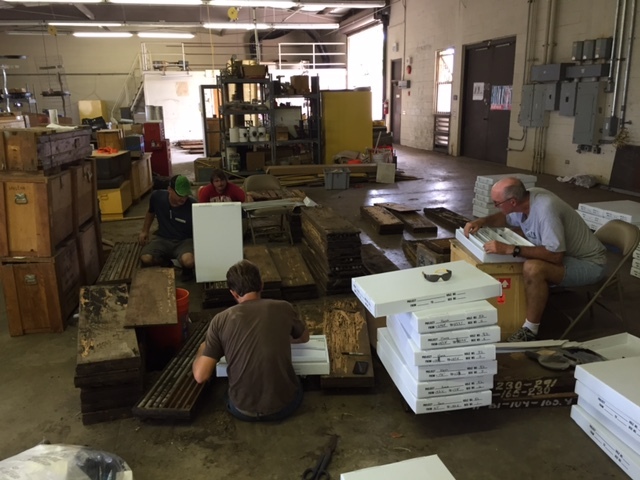 Eric, Kyle, Donnie, and Chuck transfer the rocks drilled in the 1930s from termite-eaten boxes to new plastic ones. Previously, very little information was known about this largely unexplored area. 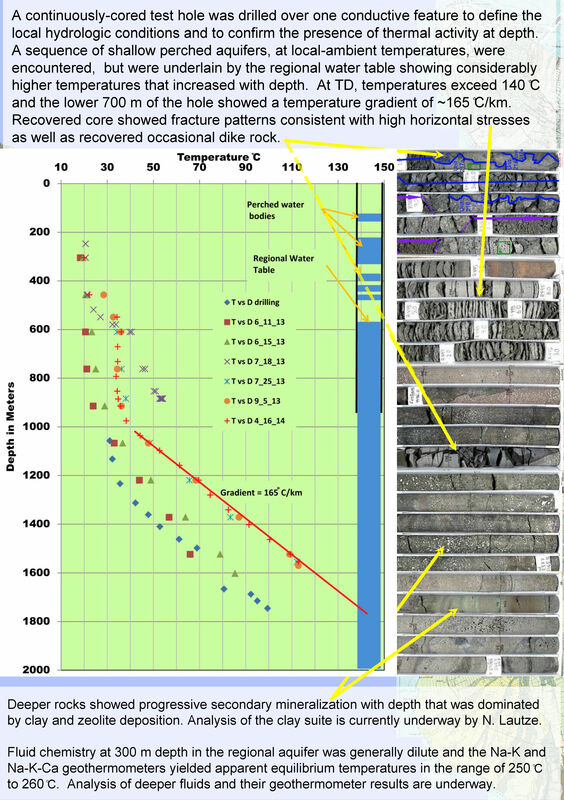 Prior drilling used rotary drilling methods, which revealed very little stratigraphic data and did not suggest a standing water table at shallow levels. 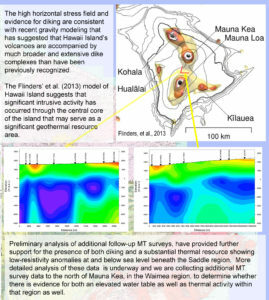 Furthermore, prior models of Hawaii Island’s groundwater predicted the stable water table in this location would be at depths of 5,000 to 6,000 feet. Geophysical data collected in the central Saddle region between 2004 and 2007 measured subsurface electrical resistivity to depths of 6,600 feet and suggested freshwater saturated basalts may occur at depths of less than 3,300 feet. These geophysical data were enlightening, and led to our important findings. The U.S. Army funded the drilling, initial characterization of the core, and ongoing analyses of the fluid. Detailed logging of the core was supported by the National Science Foundation.